In 2015 the Office of Scholarly Communication (OSC) started two related programmes. The Supporting Researchers in the 21st century programme is an ongoing series of talks, events and training sessions for the library staff in Cambridge. Some of these we have blogged to share the insights with the wider community – see: Openness, integrity & supporting researchers, Tips for preparing and presenting online learning, Evolution of Library Ethnography Studies – notes from talk, Libraries of the future – insights from a talk by Lorcan Dempsey, Software Licensing and Open Access, Open Data – moving science forward or a waste of money & time as a few examples. The second programme is the Research Support Ambassadors. This began as an idea for people, gathered from across the diverse community in over 200 libraries in Cambridge, to be trained up and develop resources for our research community. As with all nebulous ideas what we began with and where we are now are different, but the programme is taking good shape and after consolidation in Lent Term 2016 will be launched across the University. This blog is an insider’s view of the Ambassador programme from Claire Sewell, a member of the first group to sign up to the programme. Claire has recently taken on a new role in the OSC as Research Skills Coordinator and will have responsibility for driving the future direction of the Ambassador Programme. Joining the rapidly moving world of Scholarly Communication can be daunting for even the most qualified information professional. Library staff must absorb a wealth of information at the same time as trying to educate users on the latest developments and it can be difficult to know where to start. The Research Ambassador Programme at Cambridge University provides one approach by upskilling library staff at the same time as creating experienced trainers. Who are the Research Ambassadors? The Programme was launched over the summer with a view to implementation during the Michaelmas term. Ambassadors would be given training and support to develop and deliver a range of training products in areas covering the Scholarly Communications remit. 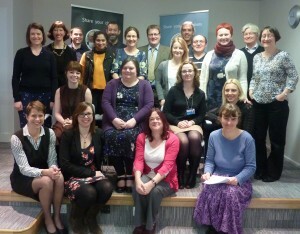 Staff from a range of backgrounds across Cambridge were quick to sign up and the first cohort began its preparations. For me the Programme came along at exactly the right time and fulfilled a number of needs as I was able to improve both my subject knowledge and more practical aspects such as teaching skills. The Programme also gave me a chance to work with colleagues I might not ordinarily get a chance to interact with which helped to broaden my perceptions. Library staff at all levels were encouraged to get involved in a variety of roles from administrative duties to content delivery. This inclusive approach has been one of the key strengths of the Programme as it helps to encourage those who may not normally sign up. There is no pressure to take on a particular task so participants are able to stay within their comfort zone. I knew from the start that there were areas I could work on easily and areas where I would challenge myself and decided to focus on the latter as for me that is what makes a learning experience. The first stage of the Programme involved observing an existing teaching session delivered by colleagues in the Office of Scholarly Communication. I found the observation sessions really interesting as they gave me a chance to reflect on the different ways people approached similar tasks. Our observations were guided using a prompt sheet which covered everything from setting up the room upon arrival to how well the content was explained by the presenter. Watching a session with a critical eye like this is a great way to improve your own practice as a trainer and something I will be looking to do more of in the future. It was then time to turn our attention to our own training needs by attending two intensive training sessions. The first session looked at knowing your audience, how to deliver a presentation on a practical level and how to avoid basic mistakes. Next we looked at the actual content of the session we would be delivering in more depth. The biggest decision to make was which aspects of such a huge area as Scholarly Communications we would cover in our final information products. We felt this was a good mixture of the topics we felt confident teaching and those we wanted to know more about. We divided into groups looking at individual areas and I chose to go with something I was less familiar with (research support services across the University) in order to broaden by knowledge. As the Programme progresses there will be a chance to explore working in other groups. The groups then got together to discuss what sort of product they would produce. The results ranged from formal presentations to interactive websites and the variety of products showcased the diverse range of talents participating in the Programme. At the end of this process we presented our ideas to the wider library community and received some valuable feedback which we can use to adapt and improve our products before releasing them into the wild. See ‘Research Support Ambassadors – a Project Update‘ for a discussion of the presentation. Overall the Programme has been a real professional highlight of 2015 for me. As well as developing new skills, meeting new people and learning about a developing area of librarianship I gained a new role when I became Research Skills Coordinator with the Office of Scholarly Communication! As part of this role I will be helping to lead the Research Ambassadors Programme forward to its next stage and possible future runs. I am very much looking forward to seeing where it can take us!